These Black/Coffee Reversible Fingerless Gloves are fashionable and FUNctional! These gloves look sharp with your suit or outdoor gear. Change from black gloves to rich brown gloves in a snap. Get two great looks with one pair of gloves. Men and Women like this neutral style. 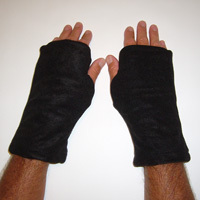 The Black/Coffee Reversible Fingerless Gloves are made of premium fleece (U.S.A.) and suede cloth (Imported).